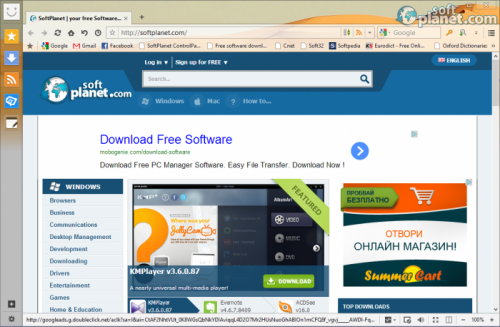 SoftPlanet makes it possible for everyone to get free Maxthon Cloud Browser download directly from our servers. There is no registration needed for downloading. 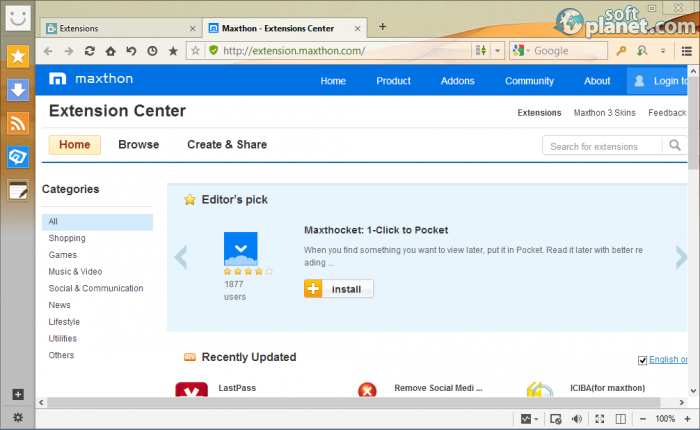 Maxthon Cloud Browser 4.4.8.1000 is a free web browser, developed with a completely customizable and user-friendly interface. It comes with high speed and great overall performance as well. Maxthon Cloud Browser provides you with some great features, which improve your working experience. 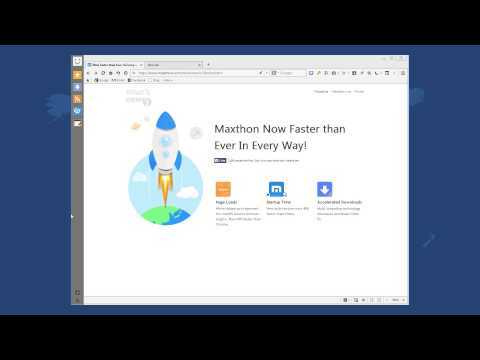 Maxthon Cloud Browser uses a unique, innovative dual-core design that uses both Webkit and Trident. It is fast and efficient. Thanks to the dual-core design Maxthon Cloud Browser displays all web pages quickly and reliably. It allows you to send text, images, links and tabs to Windows operating systems and even share all these things with friends. 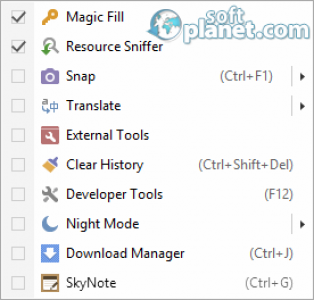 This innovative browser application comes with a built-in cloud file-sharing system. You are able to download and upload files to My Cloud. Thus you can be sure in regards to your data. Once you have created an account you can sync it with any other device you have. 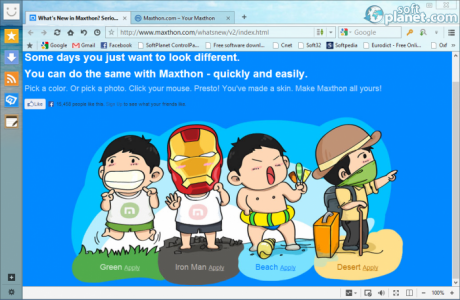 Maxthon Cloud Browser comes with several features, which will improve your working experience. The SkyNote and Do Not Track functions are some of them. As you may suggest the first one allows you to save and access text notes anywhere, anytime. You can also sync them across Windows and Android. The Do Not Track functionality provides you with the possibility to protect your privacy by preventing ad networks from tracking you. 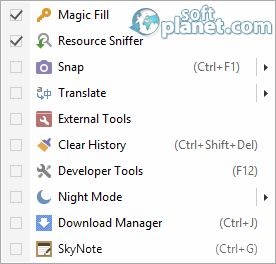 Maxthon Cloud Browser 4.4.8.1000 also has a great snap functionality, which provides you with advanced capturing options. It comes with many built-in extensions as well, which are optional for other browsers. The interface is simple and very classy. There are a few similarities with Internet Explorer, but most of it is absolutely different and innovative. Once you have installed the application, the first thing you need to do is to choose among several skins. However you are able to create and apply your own ones. So you are able to match your OS theme completely. You can customize its entire look. The interface supports two modes (Reader and Night), which change the color scheme in order to keep your eyes as safe as possible. The developers really think about users. Some producers try to implement as many features as possible and forget to make them actually accessible and valuable to the consumer. Mysoft Technology has succeeded to achieve perfect balance between functionality and usability. Most of the features are accessible even from the main window and you don't need to dive within infinite menus to reach them. It works very smoothly. The pages load impressively quickly. The application didn't crash even once. The Mouse Gesture functionality is one of the things that greatly impressed me. 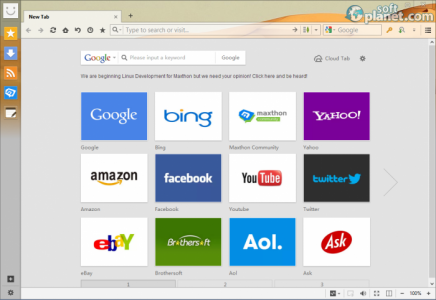 For instance, Maxthon Cloud Browser allows you to switch between the tabs with holding right-mouse-click and scrolling. Of course, you are able to set your own mouse gestures, so you can improve your working experience. This smart browser totally eliminates the need for third party software applications during your online browsing. Maxthon Cloud Browser is a web browser application, which can compltely replace its more popular competitors like Google Chrome, Mozilla Firefox, Internet Explorer, etc. We really choose it among all its rivals, because of its features-usability-reliability ratio. It is really good news that actually there are some other competitive web browsing solution on the market besides the ones, developed by Google, Mozilla, Apple, etc., because as you are probably aware, competition is not actually a nice thing for business. It speeds up the development process. Maxthon Cloud Browser is VIRUS-FREE! Our security scan shows that Maxthon Cloud Browser is clean from viruses. The current version of Maxthon Cloud Browser has been scanned by our system, which contains 46 different anti-virus algorithms. That ensures that Maxthon Cloud Browser 4.4.8.1000 is 100% safe for your computer.